PVC (Poly Vinyl Chloride) is a type of plastic. PVC matting can be seen on the floor and walls of buildings which can also be used in the floor of a car. Sheets of PVC are cut and glued and laid over the OE carpet of the car. The advantage of PVC flooring in cars is, the floor of the car can be cleaned easily with a wet cloth unlike the OE carpets. 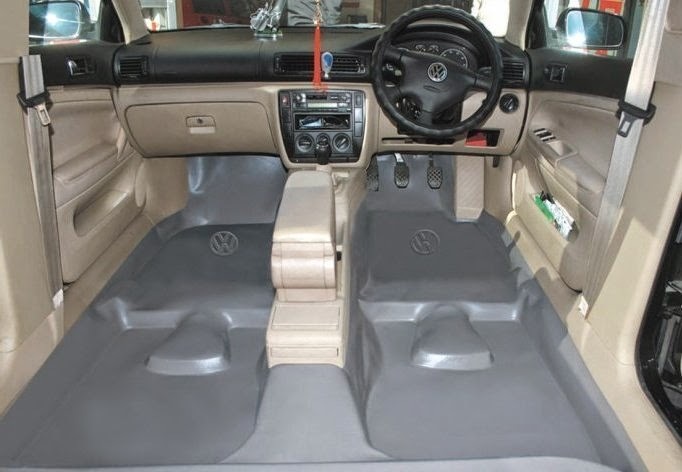 Rubber mats on the PVC flooring can be put to enhance the ambiance of the car. How is PVC flooring done in cars? PVC sheets are available in market and come in 3x4 ft size. Before staring both front and rear seats are removed by loosening the nuts/bolt. The carpet is cleaned neatly with the help of vacuum cleaner. 4 PVC sheets are necessary for the 4 foot wells of the car. Each PVC sheets are laid on the carpet in the foot well and cut according to the elevations and glued together. The sides of the PVC sheets are then tucked inside the sidewall beading/plastics. The procedure takes 1 to 2 hours depending upon the skill of the person who does the job. The work needs high skill of craftsmanship and an experienced person can do a good job to your car. PVC sheets are available in 4 colours - Ribbed Black, Grey, Beige And Transparent. 1) The OE carpet does not get expose to dust, hence gets protection. PVC sheets are water resistant and any spillage of water can be wiped with a cloth. 2) The floor of the car can be wiped and cleaned with a wet cloth – helpful in rainy seasons. 1) Unskilled craftsmanship can ruin the job otherwise neatly done by an experienced person. Also the glue might spill on the carpet and could get damaged if you want to remove the PVC flooring. 2) Have to remove the seats which are a cumbersome work. 3) Though PVC matting helps maintain cleanliness of the car, it spoils the ambiance of the car. 4) There could be fungal growth beneath the PVC sheets which may damage the carpet and may cause corrosion of metal floor of the car. 5) The smell of the PVC sheets is not acceptable to all.